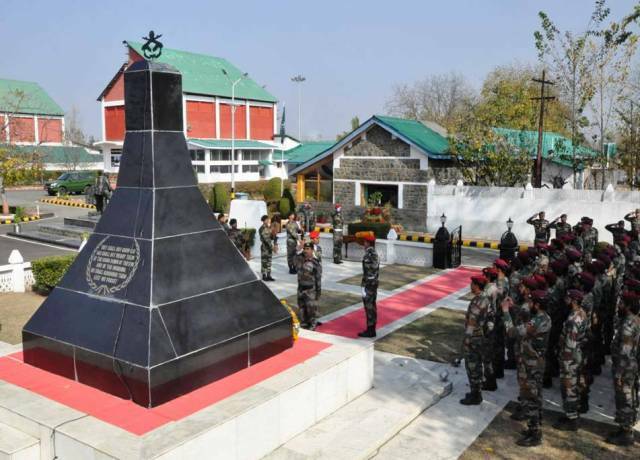 Srinagar, November 07 (Scoop News)-To commemorate the valour and sacrifice of the brave paratroopers of 3 PARA (Special Forces), a wreath laying ceremony was organised at the War Memorial at Shalateng Garrison on the occasion of 'Shalateng Day'. In a solemn ceremony, Lt Gen AK Bhatt, GOC 15 Corps, and all ranks paid homage to the martyrs on behalf of a proud nation. It was on this day that the first decisive victory of 1947 against the Pakistani Raiders was achieved, which resulted in complete rout and annihilation of over 500 enemy raiders. This defeat completely removed the threat to Kashmir from the Pakistanis. On the Battle Honour Day, the Chinar Corps Commander complimented all ranks of 3 PARA (Special Forces) and affirmed that the valiant troops of Army would continue to defeat the nefarious designs of the enemy.